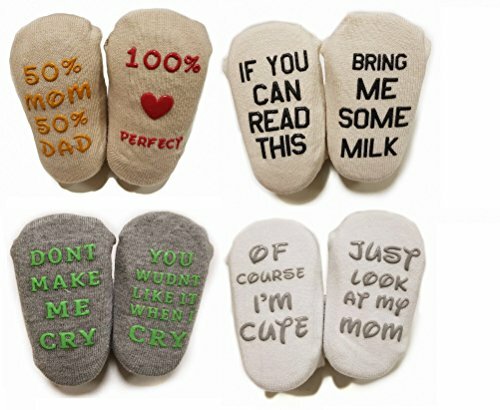 This baby socks gift box of 4 pairs of unique quote non-slip baby socks is like no other. A truly original baby gift of which the copies and imitators cannot compare. Made of 90% combed cotton and 10% spandex these baby gift socks are beautiful to touch and lovely to wear. Baby gift socks colors of fawn, white, cream and grey are neutral and suitable as much for boys as they are for girls. The cute quoted messages on the soles are rubberized and non-slip. BABY SHOWER OR NEWBORN BABY GIFT - problem solved with this unique baby gift box of 4 pairs of baby quote socks. Twinkletoes are the Original cute baby quote gift socks and are made to the highest standards - don't be swayed by poor quality knock-offs. A beautiful gift that will be treasured. SOFT TO TOUCH and won't irritate baby's skin - combed cotton baby socks with a touch of spandex for stretch-ability. The combed cotton adds a touch of elegance while the cheeky and fun non-slip quotes put a smile on everyone's face. THE ORIGINAL - Twinkletoes by Mommachi are designed and made with thoughtfulness and care. We love that warm feeling of giving and receiving gifts and we designed this cute socks gift box to ensure genuine smiles are had all round. If you're not entirely happy with this delightful little gift let us know and we'll do everything we can to help. If you have any questions about this product by TWiNKLeToeS, contact us by completing and submitting the form below. If you are looking for a specif part number, please include it with your message.